Morley M2 Mini is among the best expression pedals on the market right now. In a world where brands are racing to build the smallest pedal ever, Morley let loose a bit with the M2. This is just one of its several quirks which makes it a really interesting alternative. By all accounts, M2 Mini is a rock solid pedal. Morley went with a rolled steel chassis, which gives it all the necessary rigidity to withstand all kinds of abuse. What is interesting is the design of the pedal itself. Usually we see a super compact package where the actual pedal part of the device outlines the chassis. With M2 Mini, there is an actual base below the expression pedal, which is wider. There are advanced shapes anywhere. Every surface is just a plain steel plate that has been bent at a 90 degree angle. Some might dislike this aesthetic, but we feel it gives the M2 a very industrial appearance. In terms of inputs and outputs, you get a set of standard TRS ports. In other words. In other words, this isn’t one of those pedals which you can use with more than one source. When it comes to controls, Morley M2 is about as simple as it gets. You basically have the main pot to work with and nothing else.The most important question that arises is whether or not Morley M2 is compatible with various devices, or is it one of those pedals that is picky in this regard? If this is something that troubles you, it shouldn’t. Morley did a good job at building M2 in a way that makes it functional with a whole variety of pedals, instruments and devices. Is it going to work with everything out there? Probably not. However, you will find that its range and flexibility covers most common applications. The cool thing about Morley’s M2 pot is that it’s borderline indestructible. At this price, we really appreciate the level of precision and quality Morley has put into this pedal. Performance wise, M2 is great on all accounts. The benefit of having a chunkier expression pedal is that you don’t have to worry about the throw or cam system being weird. This pedal offers that all familiar feedback you often find in full size Wahs. Morley is very proud of the fact that M2 offers very even voltage delivery, which definitely shows when you start using it. Another detail worth some praise is the grip pad they have used. It is not as aggressive as some out there, but it doesn’t have to be. It gets the job done, which is ultimately what matters the most. Despite looking clunky, Morley M2 is quite easy to use. Even more surprisingly, it is not as big, nor heavy as it looks on the outside. Generally speaking, at this price you can’t really find a much better package than this. Morley M2 Mini goes along with what most of us expect from this brand. The pedal is rock solid, features great build quality and generally brings reliable performance to the table. Morley chose a very balanced set of features and paired it with an equally as balanced, affordable retail price. 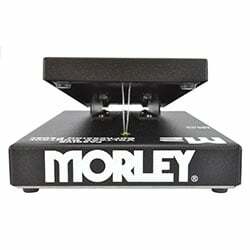 For more info about the Morley M2 Mini, click here.